After the return of Valery Bragin on the bench, Team Russia will probably aim at higher goals than it was with former head coach Mikhail Varnakov, whose coaching style not always seemed to fit their teams. The Russians are traditionally better while playing an offensive style, and Bragin will definitely adopt a more finesse-oriented way of play to repeat the memorable 2011 WJC success and the 2012 silver medal, with teams led by Vladimir Tarasenko and Evgeny Kuznetsov. Varnakov, however, won two Bronze Medals in the latest two WJC in spite of the cricits. The 2014 roster will be, just as other years, very competitive, even if a number of prospect will miss the tournament. It should also be kept in mind that Russian players in the CHL will play only against the teams that represents the league they’re playing in. For example, Nikita Scherbak will play against the WHL Selects only. For the North American audience it will be a good way to have a look at Rangers prospect Igor Shesterkin, who is having a good season in the VHL, Russia’s second league. Shesterkin will share goalkeeping duties with Denis Kostin, who is having a breakout season in the KHL with Avangard Omsk and is now one of the main candidates to the Rookie of the year award. Another NHL prospect worth watching will be Rushan Rafikov. The Flames prospect is getting his first taste of pro hockey this season in the VHL and he is delivering with 12 assists in 17 games for HK Ryazan, Lokomotiv Yaroslavl’s farm team. Most likely, Rafikov will be paired with the more defensive-oriented Dmitry Yudin of the SKA St. Petersburg, an interesting young defenseman with good puck skills and an okay size. Other interesting defensemen will be Vladislav Gavrikov, a long-time friend of Rafikov who plays with him for HK Ryazan, and Ziyat Paigin, a huge blueliner (6’6″, 210 lbs) who regularly plays for Ak Bars Kazan and already scored his first KHL goal. The offense traditionally will feature many players with good puck skills. One of the players to follow will be Daniil Vovchenko. The diminutive winger can be a goal machine in the right environment, but his size (5’7″, 150 lbs) limited his appeal during the NHL selections. Center forward Konstantin Okulov recently scored his first KHL goal and is having a tremendos year in the MHL, but he will face a lot of pressure due to his limited size. Jets fans will have a chance to see Pavel Kraskovsky in action. The forwards lines will most likely change a lot during the series, due to the big number of CHL players Team Russia will have this year. Nikita Scherbak and Ivan Nikolishin will play against WHL selects only. Defensemen Ivan Prokhorov and Rinat Valiev will play too. The games against the QMJHL select will most likely feature Vladimir Tkachev, Ivan Barbashev, Valentin Zykov, Maxim Lazarev, and Yevgeni Svechnikov, other than defenseman Evgeny Nasybullin. It is harder to predict who will play against the OHL selects, as OHL Russian players are on average much younger, but Sergei Tolchinsky, Nikita Korostelev, and defensemen Dmitry Sergeev and Alexander Mikulovich should be expected. Team Russia will miss some top prospects in Nikolai Goldobin, Vladislav Kamenev, Pavel Buchnevich, and Ilya Sorokin. Goldobin will keep on playing with HIFK in the Finnish Liiga, while Kamenev, Buchnevich and Sorokin played with Team Russia senior national team and will return to their KHL duties right after. Team Russia will face Team WHL in Game 1 of the Super Series in Saskatoon, Saskatchewan on Monday, November 10th, while Game 2 will be played Tuesday, November 11th, in Brandon, Manitoba. Team OHL will host games 3 (Peterborough, ON) and 4 (Kingston, ON), on November 13th and 17th respectively. 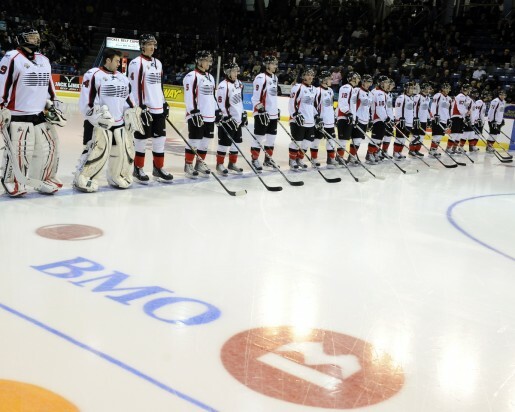 The latest two games of the series will be played by Team Russia and Team QMJHL on November 18th and 20th.